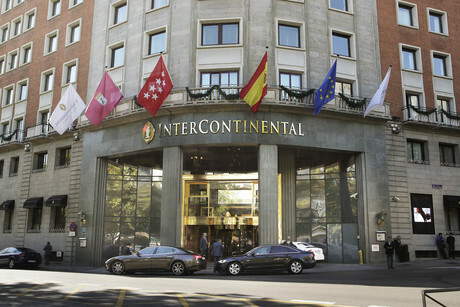 The InterContinental Madrid has reduced its energy consumption by 40% after equipping its heating, ventilation and air conditioning (HVAC) systems with ABB drives and high-efficiency motors. Through the InterContinental Hotels Group (IHG) Green Engage system, IHG has reduced its carbon footprint per occupied room by 15% between 2013 and 2017. A key area of focus in energy reduction was the HVAC systems, which can be responsible for 60–80% of all the energy consumed by a hotel. “Through the IHG Green Engage program, every hotel has to achieve defined environmental goals. But there can never be any compromise on comfort or convenience for our guests,” explained Esteban Rodriguez, Chief Engineer of the InterContinental Hotel Madrid. Located on the Paseo de la Castellana, the InterContinental Madrid was found to use a lot of energy in the eight pump groups that serve its HVAC systems and hot water supply for guest rooms, kitchens and other facilities, according to an energy survey conducted by Exel Industrial. Based on these findings, the pumping systems were equipped with 13 ABB ACH550 variable speed drives (VSDs) and 16 electric motors with IE3 energy efficiency classification, and integrated into building management systems. This upgrade provides the overall system with greater stability and higher energy efficiency, as the motor speeds are adjusted to match the precise demand at any given time. ABB’s intelligent motion solutions helped the five-star hotel exceed its IHG Green Engage system goals. It reduced its energy usage by 445,000 kWh a year, cutting the hotel’s annual energy bill by $37,000. As a result of IHG’s Green Engage program, the hotel’s carbon footprint has been cut by 253 tonnes of carbon dioxide (CO2) a year. STR Global said if similar energy savings could be replicated at just one in four of the world’s estimated 187,000 hotels, global CO2 emissions could be reduced by nearly 12 million tonnes a year. Research published by the International Tourism Partnership (ITP) shows that the hotel industry currently accounts for 1% of all global emissions, but this is expected to increase, with the total number of hotel rooms worldwide set to grow from 17.5 million to over 25 million by 2050.